I became serious about painting 11 years ago. I went to a few art classes to begin with. I’ve always had a natural talent and am very creative. I learned quite a few mediums at first as I wanted to figure out what I like best. I then found I love working with pastels. I went straight into doing pet portraits. I did that and realism. That was okay for a while, but I found it to be too serious as I’m a perfectionist. I needed to branch out and find something fun to do. So I searched out YouTube videos looking for something I might be interested in. That’s when I found acrylic pouring! Well now I’m having a blast… but still something is missing for me. I started to see creations within the pours I did and then started to embellish on them. I had no idea that was a thing either until I was invited to another group for embellished pours! So let’s get started on the process of the wise old owl I painted.. I didn’t know it was going to be an owl at first. But I wanted a background that looked woody so that I could embellish something to do with nature. I used a 12×20” stretched canvas. Which I primed with Gesso and let dry for 24 hours. For the pour I used two parts floetrol one part paint little water until I got a honey like consistency. No silicone. 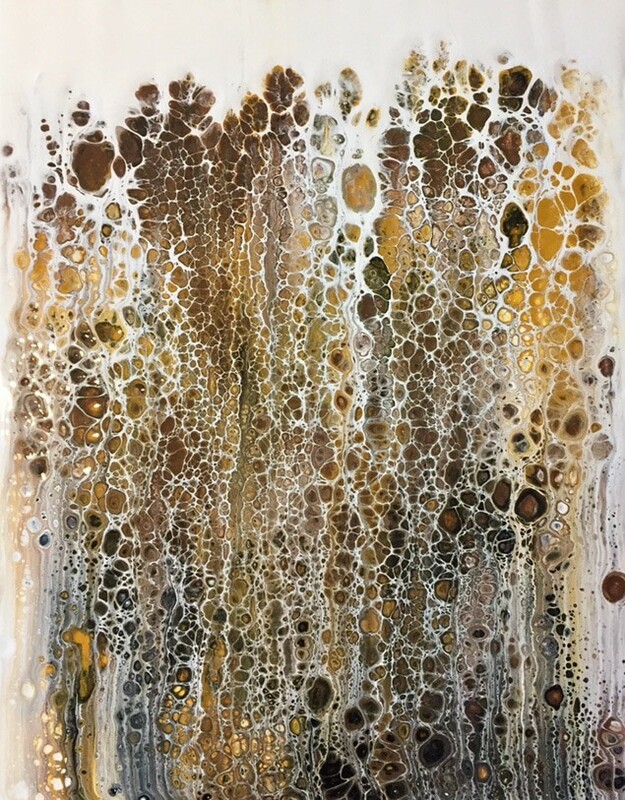 The colors for the pour I used liquid craft paint… golden brown (added to the golden brown just a little vintage gold metallic) burnt umber, black and white. I layered the pour in vertical stripes starting with black at the bottom. Then I randomly layered the other colours working my way up to the top of the canvas. I added a small strip of black in the middle bottom too. At the top I used a bigger white stripe. Then I did a swipe. I swiped down starting from the white with dry paper towel, a big enough piece to cover the whole top of the canvas and swiped the white all in one swipe all the way down to the black. I let the canvas dry for a couple weeks. Now for the embellishment: I used good quality heavy body acrylic paint. Colors are titanium white, burnt umber, yellow ocre, raw sienna, burnt sienna and black. Oh and tiny bit of phthalo green for the eyes. 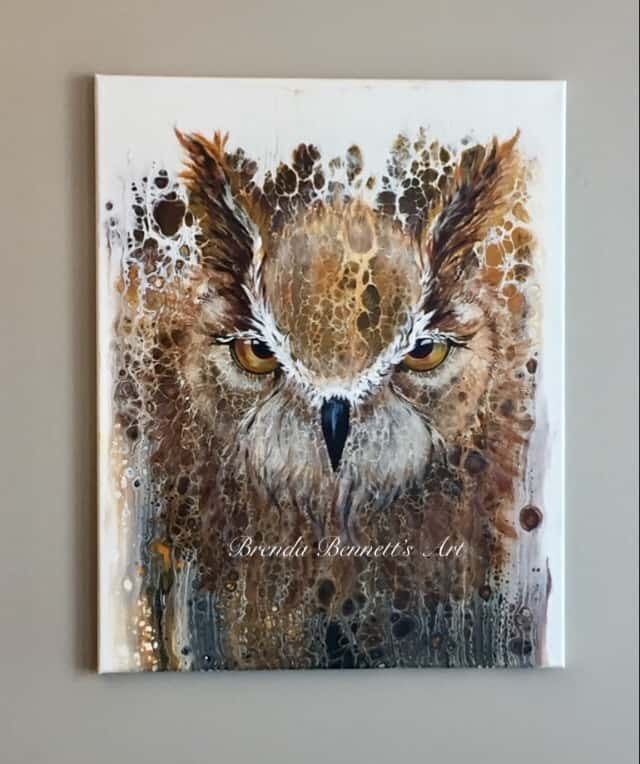 I sketched the owl onto the dry poured canvas with a soft white pastel stick. I painted the eyes and beak first. Then I painted the rest of the owl. I watered down my paints in certain parts so I could still see the pour come through the owl. I didn’t use a spray varnish or any other type of shine. When you use good quality paints you don’t need that. Unless you personally like the shiny look. So there you have it! It’s finished and I love it! My wise old owl. Old soul and artist at heart! 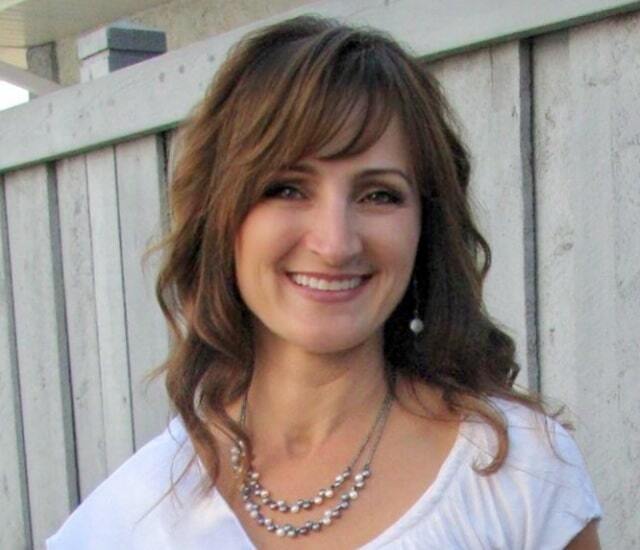 Born and raised in a small town in northern Alberta, Canada. I was inspired by the beauty I was surrounded by. During our long cold Canadian winters I sketched and danced. Those were my first passions. Later on I opened up my own Hair studio and I continued to create for the beauty industry! I married my childhood sweetheart, we have two boys and through them our family is expanding! I am now semi-retired and have begun to focus more on my art! I look forward to spending more time creating and dabbling in new mediums! Beautiful Brenda! You are so talented. Congrats on your art, and your post! Awesome Brenda. You’ve outdone yourself. I love the owl and your use of colour. I’m impressed, it looks awesome. Absolutely beautiful and inspiring! Thanks for sharing! I love that you used subtle colors to produce such an engaging painting. Good work! Brenda, that owl is sensational! What beautiful work you do. wow! I’ve always seen things in the clouds and now because of you, I’ll look for things in my pours. Thank you. The owl is beautiful. I love your wise old owl Brenda! I found your history blurb very interesting because it is so similar to my own! I lived in Kinuso, Alberta when I was a very young girl. ( My dad’s side of the family is there.) am retired from Hairstyling (managed the shop), married with two daughters who are grown, and began working on art again after having loved it, dance, and stage and other forms of the Arts! Cool, huh? May God bless you. Your owl is awesome!! Thank you for sharing. You might want to correct ‘vertical’ to horizontal. … “I layered the pour in vertical stripes…” Vertical is up & down. Horizontal is side to side, left to right/right to left… like the horizon. Its just perfect! I love your patience in letting the swipe dry. Must work on that! Lol. Very inspiring. Beautiful! Maybe someday I’ll be talented enough to try something like this. I just love it, thank you for sharing. I love owls and have always admired their ability for camouflage. What a great way to illustrate this. Your painting is wonderful! Fantastic job. Very creative. I would like to try it with your permission. The embellishments is something new for me. Haven’t heard about this. I’m going to take a look at my paintings and see what I can come up with. Great job. Love it! Absolutely love this. I don’t have an artistic bone in my body but I do enjoy doing a pour. Even my swipes don’t look like anything! haha Keep up the good work! Your Owl is great! You did well seeing him hiding in the paint! Do you ever do videos to show your technique? Something like this seems like it would have a high level of artistic ability and would definitely benefit from a video. It turned out beautifully. That is very inspiring. I love the idea of using the pour as a background and painting on top! Awesome. I’ve discovered acrylic pouring – have not done anything yet, except learning and admiring what people did. Will soon buy my stuff and start. You are so talented! Your work is beautiful. Absolutely gorgeous. I love owls. Amazing… thank you for sharing! Bonjour Brenda, je viens de découvrir votre super talent. Vous avez peint un de mes oiseaux préféré et en plus vous nous donnez votre recette de couleurs. Merci de votre générosité et encore bravo pour votre créativité! Wow, inspiring! Thanks for sharing your creativity with us! What an amazing picture. Interesting to read the steps taken to produce this wonderful owl. Thank you. You have just inspired me to try embellishing some of my pours. Thank you. Wow! Love it, thanks for sharing your work. Must try and se what animal I can find. really inspirational and so creative! Are you going to sell it or keep it? WoW !!! That owl is amazing ! I just found your site and I feel very inspired now .